These are photos of the posterior pole of a 31 year old female with best visual acuity of 20/50 in the right eye and 20/15 in the left. The left fundus looks normal. 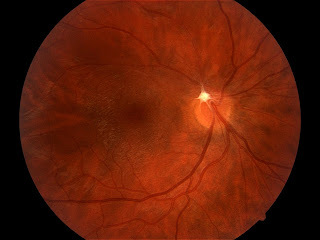 The right optic nerve has white, fibrous tissue attached to it which I’m calling fetal tissue, even though it’s unusual. There is some macular epiretinal wrinkling in a pattern that appears to be more tractional than puckering, similar perhaps to that seen in cases of toxocara. 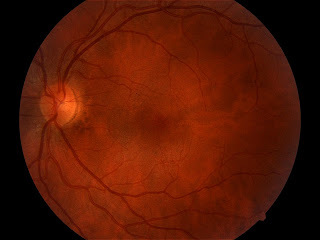 But the other interesting point is that the optic nerve also appears to be underdeveloped, and the blood vessels emanate more from the rim than from the center, suggestive of optic nerve hypoplasia.